Photographer Emanuele Equitani followed the preparations for "The Last Great Race on Earth", where mushers and their dogs race their sleds across 1,900 kilometres of frozen Alaskan wilderness from Anchorage to Nome. Eighty-seven long years ago, a group of courageous mushers and their teams of huskies saved the village of Nome from an epidemic of diphtheria, carrying life-saving serum to the stricken town by sled, more than 1000 kilometres deep into the wilds of Alaska. More recently – in 1948 to be precise – a certain Joe Redington Senior arrived in Alaska with just eighteen dollars in his pocket, thirteen of which he immediately spent on a 40-hectare piece of land in Knik. Initially this might not have seemed like a particularly wise move, seeing that he was left with only five dollars, but Joe Redington soon discovered that a few metres from the edge of his property was the historic Iditarod Trail – once the only cross-country route used to carry the mail by dog-drawn sled from Seward to Nome. Being a traditionalist and a lover of nature, Redington was worried that one day motorized snowmobiles would replace dog-drawn sleds entirely. It was his idea to organize a competition for mushers and their teams of huskies on the historic Iditarod Trail and he put all his energies into making his dream a reality. His efforts were crowned with success when, in 1973, thanks to Redington, the first ever Iditarod Trail Sled Dog Race was run, covering 1,750 kilometres from Anchorage to Nome. 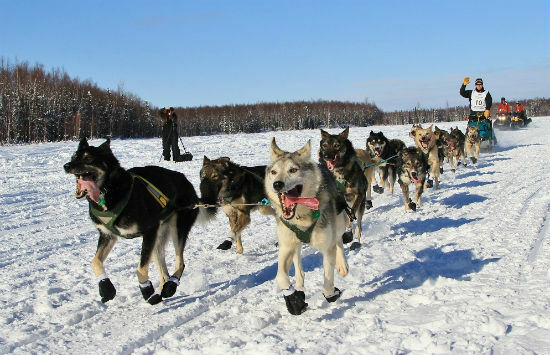 To this day, Iditarod still takes place between Anchorage and Nome, attracting thousands of people. This thrilling test of endurance – proudly called “The Last Great Race on Earth” – is held each year at the beginning of March. This year I was there to photograph the event’s fortieth edition. Long before the start, I was already on 4th Avenue taking shots of the mushers and their huskies making last minute preparations for the race. On a side street by chance I met Lance Mackey, veteran of Iditarod and 4-time consecutive winner of the race, undoubtedly one of the best-known and important figures in Alaska. Lance had beaten cancer and returned to race again – it is no wonder that among Alaskans his name is legendary. Despite being busy preparing for the race, Lance kindly made time to have a chat with me and I took the opportunity of taking a few photos of him putting the final touches to the sled and the dogs’ harness. Although Anchorage is the symbolic starting point for the Iditarod, in reality, once the teams have set off from 4th Avenue and covered a couple of kilometres, the mushers stop their dogs, load everything onto their trucks and travel north to Willow. It’s from this small village of 2,050 souls that the real race begins – with the starting line set up on a frozen lake. When you get to Willow you can tell immediately that there’s a whole different atmosphere around this incredibile race. First you have to leave your four-wheel drive in an improvised parking lot on some rather rough (to put it mildly) terrain. From there it’s a kilometre on foot through the snow, the woods and the rather cute elk droppings. (Why cute? Because they look like golf balls made of grass! In fact in Alaska they make bracelets, necklaces and other decorative things out of these very droppings!) Once you get through the woods, you see classic hot-dog and coffee wagons set up in the open (at around minus 20° Celsius!) along with stalls selling leather and fur pelts to make hats and gloves with … this kind of welcome is a far cry from the official starting line in Anchorage, with its many colourful shops, bright lights and large crowds of spectators. However I can assure you that being at the starting line in Willow is a much “warmer” and more traditional experience – in true Alaskan style. Leaving the hotdog vendors behind, we turned towards Willow Lake, a vast expanse of ice surrounded by forests. The real Iditarod starts here. 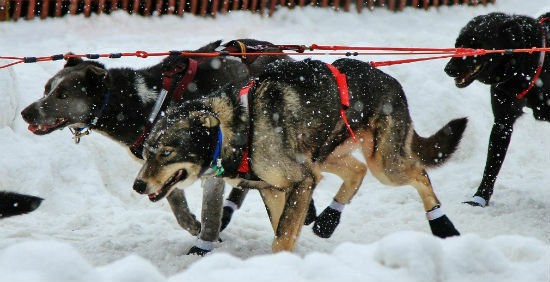 You could tell from the faces of the mushers that from this moment on, the race gets serious. From here they have to travel around 1,900 kilometres in extreme temperatures and conditions, passing through various base camps before arriving at Nome. Who can take part in the race? 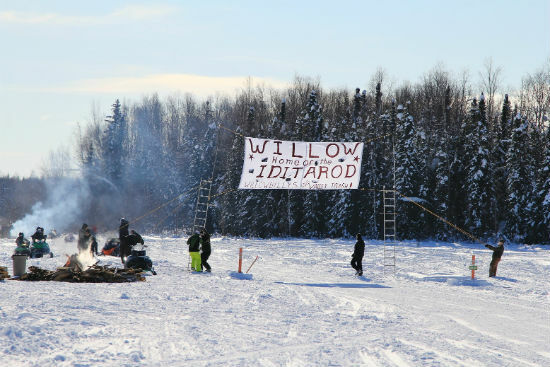 There is no limit on the number of participants in this race (in 2013 there will be 58 teams taking part) but there is a “Board of Directors of the Iditarod Trail Committee Inc.” which evaluates applications from those wishing to take part. In terms of attitude and experience, the mushers have to be up to the rigours of the gruelling race and the dog teams have to measure up to race requirements. Factors like the ability to cover long distances safely and the relationship between the dogs and their musher are also taken into account. Teams with less than six dogs are not eligible, because it would be too exhausting for them. Also dogs can sometimes get hurt during the race and have to be taken out of harness. 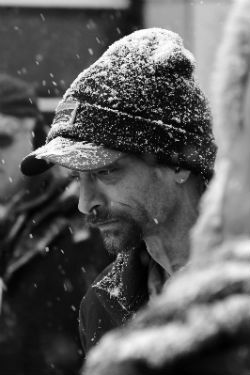 There are official Iditarod vets at checkpoints along the way who make sure the minimum number is respected and who also check on the dogs’ condition. The 25 checkpoints are not comfortable huts where the mushers can stop off to eat and sleep – in most cases they are simply snow-covered plains where the support helicopters can land with food and water for the men and their dogs. 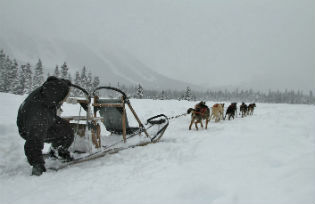 The mushers generally sleep on the snow or occasionally in their sleds, but not before having prepared a shelter for their trusty dogs, using the straw that they always carry with them. Similarly the mushers feed their dogs first before they eat anything themselves. Truly a mutual relationship of deep affection and trust. The arrival of the mushers and their dogs in Nome is the occasion for great celebrations, with the teams given a hero’s welcome – just as they were 87 years ago when the village was saved from diptheria. I asked myself what happens to the mushers and their dogs once the great race is over? To find out I visited the village of Girdwood (population 1,700), set in the midst of a forest right by the sea. There I had an appointment with a veteran of Iditarod. Now retired from racing, Dario had completed the long gruelling event nine times. He has chosen to live in this beautiful village, earning his living by offering excursions with his sled dogs, many of whom are former champions. We met up on the snow-covered plains to the north of the town, at Moose Meadows. The temperature was very low and the sky dark, covered with enormous grey clouds which seemed to look down on me from above. Heavy snow was falling. After a while I heard the sound of howling and whining coming from the woods about a kilometre away, and a few minutes later I saw Dario arriving with his splendid team of sled dogs. Like most Alaskans, Dario was immediately friendly and helpful. After I had taken a few photos, we got to talking and he kindly gave me a rundown on how the equipment and the harness works and explained the various commands that are used to drive the sled dogs. Half-an-hour later we boarded the sled and set off across the snow of Moose Meadows, taking off with incredible speed and travelling faster than I would have ever imagined. Arriving at Dario’s headquarters an hour or so later, I discovered that he lives in a small hut measuring just 4 by 6 metres. Set on the edge of a wood, it allows him to live close to his dogs. Only then did I realize the depth of esteem and trust that Dario shared with his dogs. I watched him walking among them, his gaze often meeting that of the dogs in seeming mutual comprehension. Some called to him with long drawn-out whines, trying to get his attention, as if they wanted to tell him to choose them to pull the sled, along with the dogs of our team who are waiting patiently to finish our trip. I was so taken up with my thoughts about the Spartan simplicity of Dario’s way of life – at one with Nature, needing no more than what Nature can offer, that I almost forgot to take photos. And during the return trip I almost lost the camera for the same reasons! When we arrived at our destination, Dario thanked us and said goodbye, though in reality it was he who deserved the biggest vote of thanks. 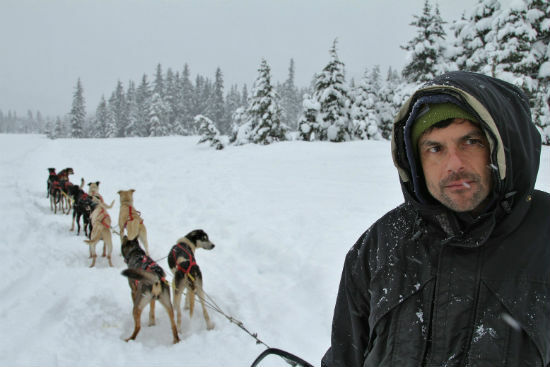 In Alaska there are many like Dario who enjoy the simple, healthy way of life. In memory of Joe Redington, without whose efforts Iditarod would not exist. Special thanks to Dario at Chugach Express Sleddog of Girdwood – through him I took some great photos and also learned a lot. Thanks to Lance Mackey for sparing his time so generously – despite being one of the most famous people in Alaska. And finally thanks to my girlfriend Laura, who worked alongside me as an interviewer and translator during our long journey in Alaska.